Colossal Dry Combo...... You can also rent this unit dry by removing the detachable pool and slip'n'slide. 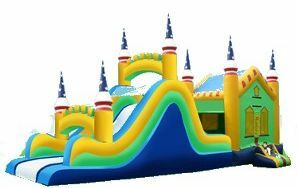 It's still plenty of fun and plenty big at 65 ft long with a two lane obstacles that go into the full size bouncer, to a dual ladder, then down a slide!! Superman Combo!.. 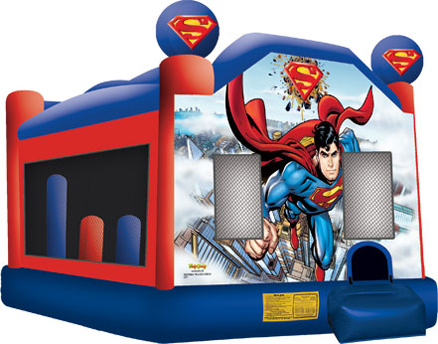 Superman is up, up and away in this classic, licensed Superman combo! 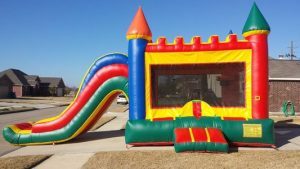 Enjoy vertical pop ups, a horizontal pop up, tunnel with pop up, basketball hoop, and jumping area! Great fun with the number one super hero of all time! Mega Combo! (Dry)… The ultimate combo, a full size jumper, basketball goal, ladder and slide, it's great fun with plenty of space for all ages.! Super Combo! (Dry)… The colorful new combo, a full size jumper, basketball goal, dual ladder and slide. 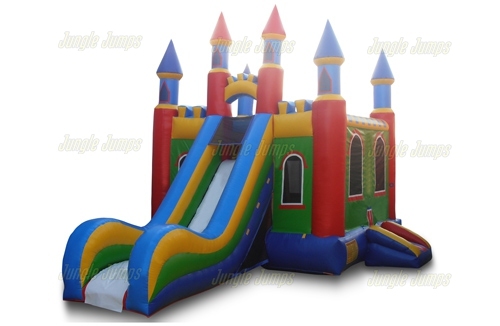 Bounce, race to the top and enjoy the steep slide down! 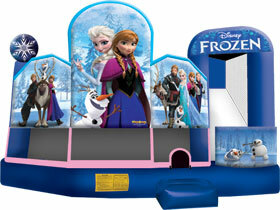 Disney's Frozen 3D 5-in-1 Combo Enjoy your event with Elsa, Anna, Kristoff, Hans, and Olaf of course! There's a bouncer, basketball goal, log and pop up obstacles, and slide. 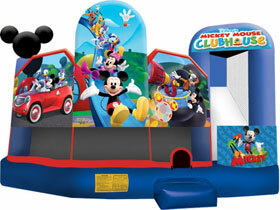 Kids of all ages will enjoy the Mickey Mouse Club House, join Mickey, Minnie, Donald, Goofy, and Pluto for all the fun! 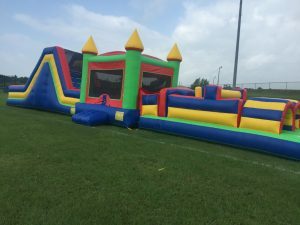 There's a bouncer, basketball goal, log and pop up obstacles, and slide. 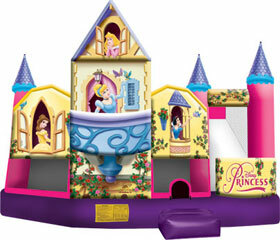 This is the ultimate inflatable bouncer for your princess! Join the fun with Belle, Snow White, Cinderella, and Sleeping Beauty! There's a bouncer, basketball goal, log and pop up obstacles, and slide. This unit is the ultimate castle combo with a full size bouncer, basketball goal, and extra long slide! Fun Castle Combo! 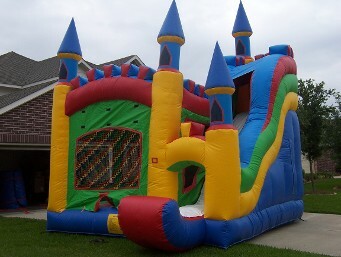 Great combo fun, a full size jumper, basketball goal, ladder and slide for children of all ages!! 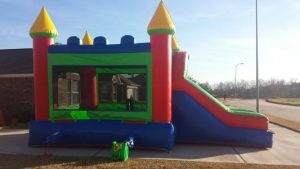 The 3 in 1 Combo is a great option for smaller areas that want a bouncer, basketball goal, ladder, and slide. 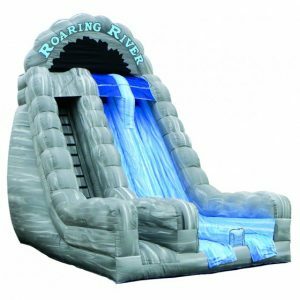 22 ft Roaring River!! Our 22' Roaring River 2 Lane Run 'N' Splash Rock Arches Combo features a radical sliding angle that's sure to get the adrenaline pumping as riders scream down our 22' slide. 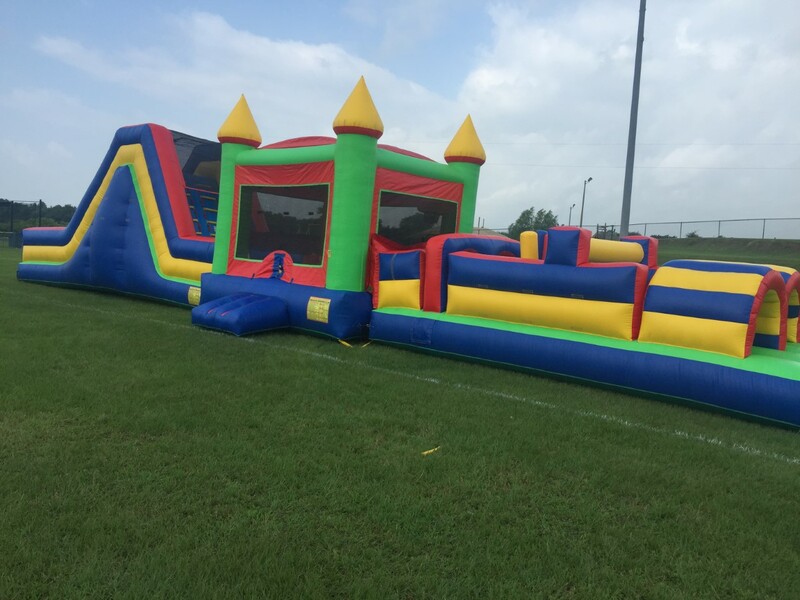 This unit is perfect for schools, churches, summer camps and more! 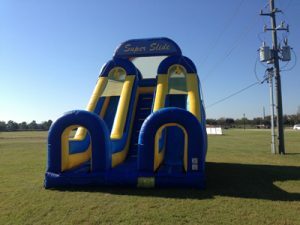 Dry Super Slide!! Double lane slide, race to the bottom, twice the fun!!! 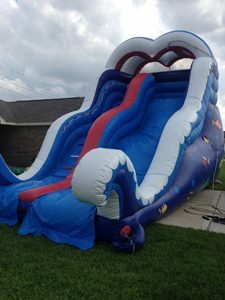 Great fun with this 20 ft high slide!! 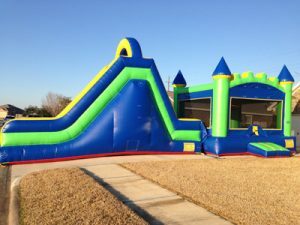 Great for big events! 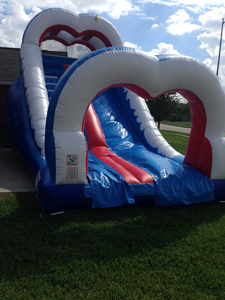 This dry slide is 18 ft tall and has a double drop bump for that extra adrenaline rush. Great for all events! 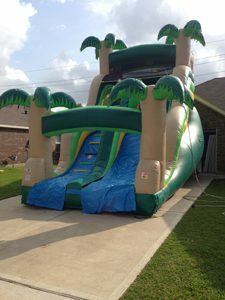 This 18 Tropical themed dry slide is great fun with a double bump that adds more fun to your event! This dry slide is great fun for all ages. Great for any celebration with sea artwork on the sides of the unit!